Cha Ca Thanh Long is one of our favorite Vietnamese dishes and we’ve already wrote about it here, but this time we’re back with similar recipe but a slight twist. 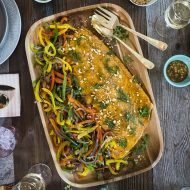 Traditionally this dish is made in small portions with cut filet of snakehead or catfish cooked table side or on a sizzling fajita style pan, but we’ve adapted it for larger groups and it’s one of our favorite go-to dishes for a dinner party. Instead of small portioned filet of fish, we use an entire filet of salmon and serve it community style on a big platter. It’s great for a dinner party because all the sauces and accompaniments can be made ahead of time. We’ll leave out all the accompaniments on the table and allow guests to pick and choose how they want to enjoy this dish–either roll it or bowl it. Roll it up into spring rolls or put it in a noodle bowl, either way, both are delicious and fun and interactive party for all. 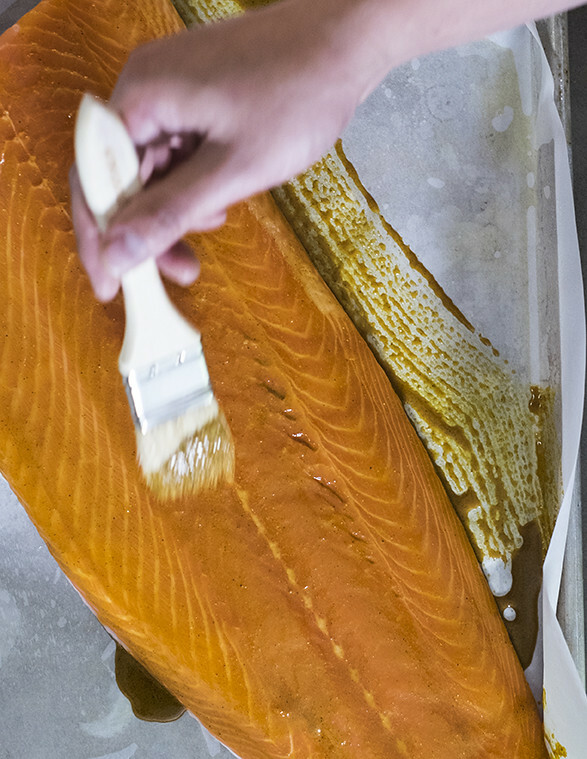 During the summer month’s it’s our favorite way to enjoy wild salmon, particularly if you can get your hands on wild Copper River salmon, it’s absolutely delicious. 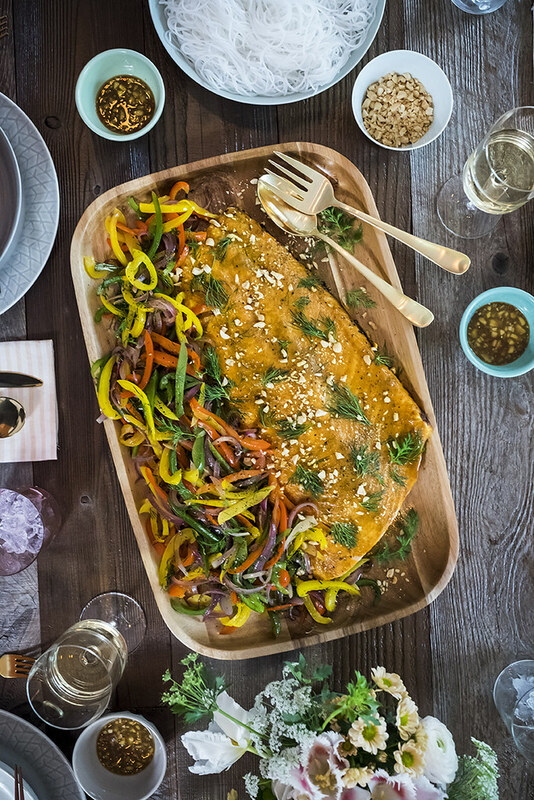 Adapted from the classic Cha Ca Thang Long from Hanoi, this recipe uses salmon and is great for feeding a larger group of people. In a small bowl, dissolve the sugar and warm water. Stir in shrimp paste, garlic, lime juice, minced pineapple and thai chile. This can be prepared 2 days in advanced. stirring, until just softened, 5 minutes. Remove from heat and stir in ¾ of dill. table, leaving room for 2 or 3 wide, shallow bowls of hot water for dipping rice papers. bowls of hot water for dipping rice papers. 5. 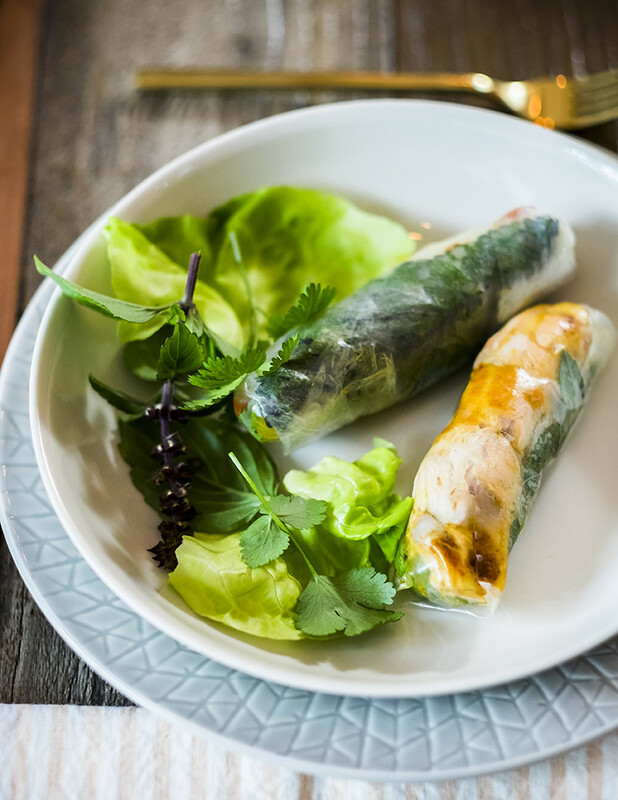 To make spring rolls, quickly dip a rice paper in hot water to barely soften, then layer with small amounts of vegetables, herbs, and noodles, and salmon. Roll up in wrapper. Dip rolls into sauces. Or build your own noodle bowl with same ingredients, drizzle with sauces, and top with crackers if you like. By the way, if this recipe and photos look familiar, it’s because it was featured in May 2016 issue of Sunset Magazine! We’re honored and humbled to have our recipes featured! Is there a substitute for shrimp paste? We don’t eat shellfish. I know that a substitution of a different fish wouldn’t be the same but I REALLY don’t like salmon. (I know. Weird, since everyone else seems to love it.) Everything about this sounds so delicious otherwise. Do you think I could substitute a white-fleshed fish instead? Or would the flesh fall apart too easily? I always look forward to new posts from you (not frequent enough!) as your recipes are so yummy. yes! any firm white flesh fish would work! 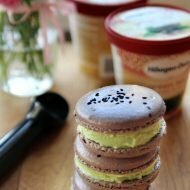 This recipe looks amazing! I can’t wait to try it. 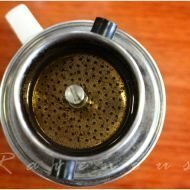 I love going out for Vietnamese food, but have been too intimidated to try making it at home. 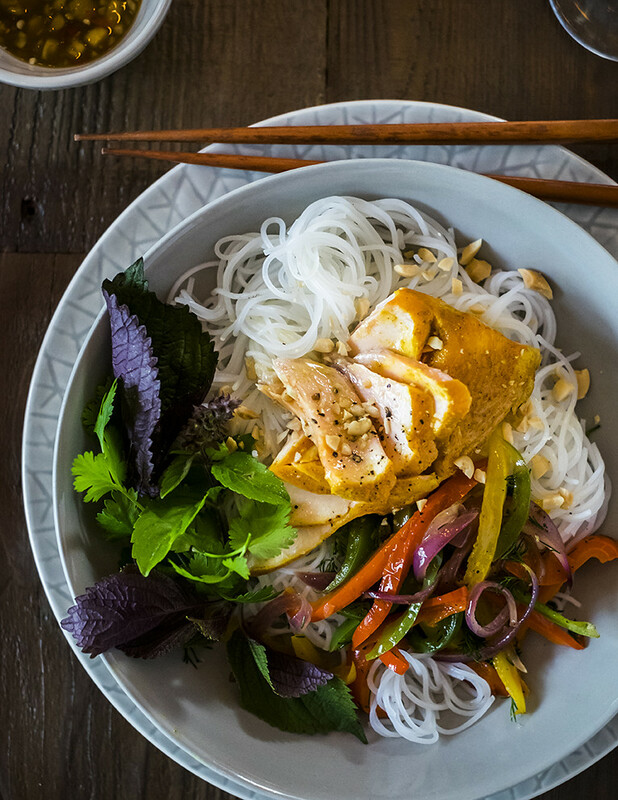 Thank you for sharing such great recipes and making Vietnamese cuisine so approachable! What a delicious dish. It is eye-catching and good for health. Hope to see you at Master-Chef. chowringhee is a brand of restaurant which too much famous and its services is known for serving. This was a really delicious recipe! I have to admit I am always hesitant to try blog recipes versus a site like epicurious or all recipes but I am so glad I did. 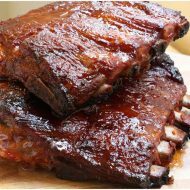 This is a fantastic recipe!